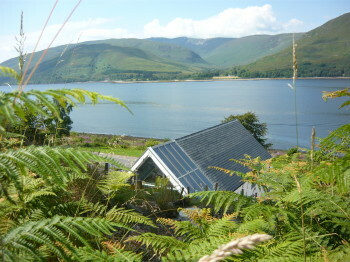 This beautiful home, self-built by Chris Philipson, is set on the west coast of Scotland, overlooking Loch Linnhe. 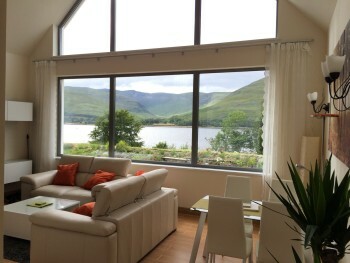 It features a splendid first-floor balcony to enjoy stunning views over the Loch, and a holiday cottage. 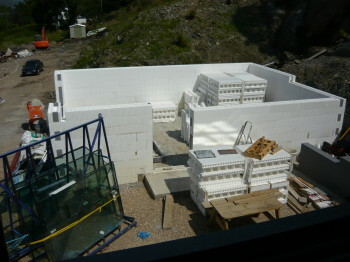 The site was difficult and restricted but the Architect, Nigel Johnston, made clever use of these aspects to create a home with unique character. Design and construction of a low energy retirement home on a restricted site in North-west Scotland. The client, with construction experience, project managed the works. The architect, Nigel Johnston of Arisaig, received a brief from the client to design a relatively small retirement home on a site constrained by a public road on one side and rock escarpment on the other, with utility services running through it. 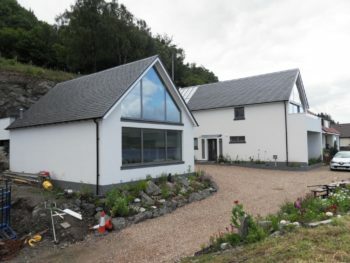 The dwelling was required to have low running and maintenance costs and, most importantly, maximise the potential views over the sea loch on the opposite side of the road. 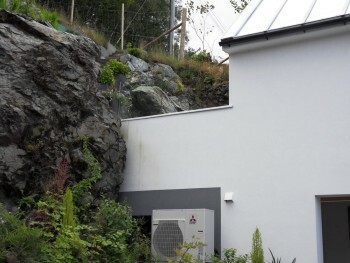 Having resolved the problem of re-routing utility services, the design was developed to use the rock face to shelter the rear of the building from prevailing winds and provide balconies at the front to obscure the presence of the road from view. Siting the building close to the rock face resulted in releasing sufficient extra area on the plot to build a source of retirement income – a small cottage for holiday letting. 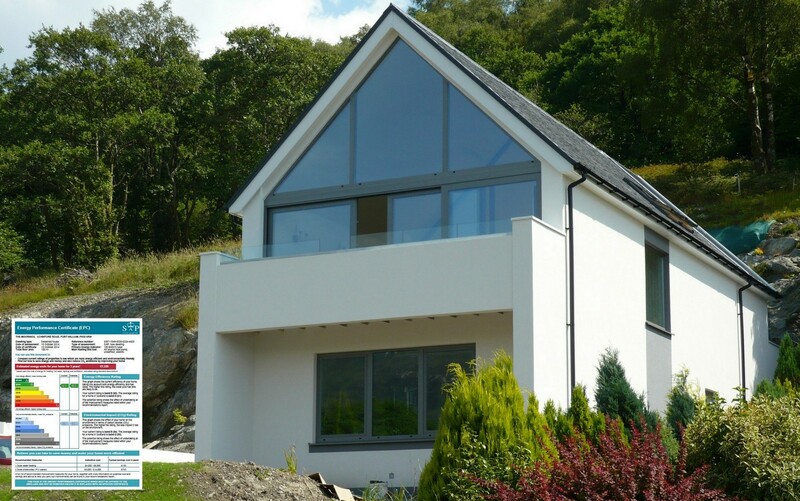 The Wallform 313 system was specified for construction of the new home, achieving a U-value of 0.18 W/m2K when finished externally with a thin coat render system. The Wallform construction, as well as being practical and quick to build, also provides excellent levels of air tightness without cold bridging, both being factors which reduce comfort levels and increase energy bills. Heating is provided by an air source heat pump supplemented by solar heat gain from the south facing sun room. Excluding the costs of forming the road access and re-routing utility services, the cost for construction of the new house and the holiday cottage was less than £750/m2. The key reasons for achieving such good value for money rest with the client, who self-managed the project, assisted with the building works and proved to be very astute in his purchasing decisions for materials and equipment. The above case study is available to download as a pdf.